RIO DE JANEIRO, BRAZIL – Odeon Petrobras in Cinelândia, Centro rolled out the red carpet on the night of Thursday, Sept. 27th, marking the beginning of the 14th edition of the Rio International Film Festival, Festival do Rio. The premiere of Brazilian director Breno Silveira’s “Gonzaga – Father to Son” opened the festival with the Minister of Culture, Marta Suplicy and Municipal Cultural Secretary, Emilio Kalil speaking at the opening ceremony. 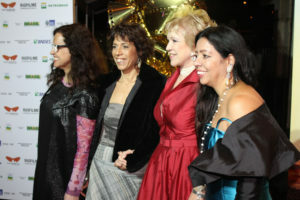 The directors of Rio Film Festival, Ilda Santiago, Vilma Lustosa and Walkiria Barbosa with Minister Marta Suplicy (red) at Cine Odeon, photo by Felipe Coasth/Rio Film Festival. Attendees for the showing afterward including directors Im Sang-soo, Jonathan Dayton and Valerie Faris, actors, Fernanda Montenegro and Julio Andrade (who plays Gonzaguinha in the film). “This is one of the five largest film festivals in the world. Is symbol of manifestation of our national identity and encounter between culture and audiovisual market .” Suplicy said in her opening remarks. Saturday saw director Jeff Simpson present “Monty Python: Autobiography of a Lie” in Estacao SESC in Botafogo and actor Terrence Howard presenting “Sem Proteção” at Est Sesc Rio 1. Roland Joffé (Director), Rodrigo Santoro (Actor)and Dean Bornstein (Producer) will present “Encontrarás Dragões: Segredos da Paixão” (“There Be Dragons: Secrets of Passion”) at Odeon Petrobras on Sunday, September 30th. The entire program can be downloaded as a PDF file here in Portuguese.